Smuggled meat seized recently by Chinese customs was sourced from reserves in foreign countries and smuggled through the China-Vietnam border, a customs official told the Global Times Thursday. Changsha Customs seized around 800 tons of smuggled frozen beef, duck necks and chicken feet worth 10 million yuan ($1.6 million) in a local warehouse and caught 20 suspects on June 1. 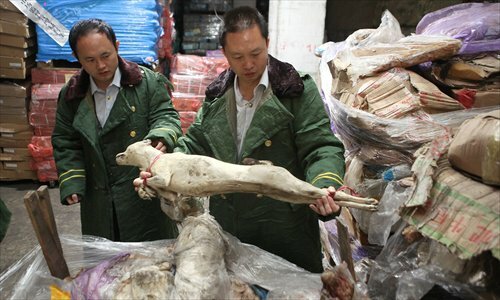 It is the biggest ever meat smuggling case in Central China's Hunan Province. According to preliminary questioning of suspects, the meat was smuggled into South China's Guangxi Zhuang Autonomous Region, which borders Vietnam, and then transported to Changsha, an official surnamed Huang with Changsha Customs told the Global Times, adding that some of the meat dated back to the 1980s. "The seized meat will be destroyed," he said. The case in Changsha was just part of a wider crackdown. Chinese customs have strengthened efforts to curb meat smuggling in 14 province and regions since June, and have so far seized more than 100,000 tons of smuggled meat with a total value of over 3 billion yuan, the Xinhua News Agency reported Tuesday. The smuggled meat poses obvious food safety risks, as it came into the country without going through the official quarantine inspection, and much of it was rotten due to poor transport and storage conditions before finally reaching customers. Industry experts said most of the frozen meat smuggled into the Chinese mainland came from neighboring countries and regions like Hong Kong and Vietnam after having been transported from countries such as the US, India, Germany and Brazil. "Most foreigners do not eat chicken feet or duck necks, making smuggling of these products a high-profit business," an official at the office for combating smuggling within Guangxi's commerce department, told the Global Times Thursday on condition of anonymity. Vietnam's foreign trade policy, which allows products from another country to be transshipped via Vietnam, has also facilitated smuggling activities, he said. Guangxi shares a 1,020-kilometer border with Vietnam, making the region a major transit point in the illegal meat trade. Smugglers often divide a batch of frozen meat into small packages in Vietnam and then transport them into Guangxi. They are then repackaged and sent to the rest of the country, according to Li Baoquan, deputy head of Nanning Customs. Nanning Customs in Guangxi has seized 23,100 tons of smuggled frozen meat worth 514 million yuan at the China-Vietnam border since the beginning of this year, Li told a press conference held on April 29. How to destroy such a large amount of smuggled meat has also become a problem, as methods such as burning or burying the meat will cause environmental problems, Wei Ran, head of the office for combating smuggling in Guangxi, told the same press conference. He noted that the local authorities are making efforts to deal with the meat in a harmless way. Of the various kinds of frozen meat, beef has become popular, given fast-growing domestic demand for it, as well as the large price gap between imported and domestic beef, experts said. Currently, Chinese authorities only allow beef imports from eight countries including Australia, New Zealand and Argentina, according to the General Administration of Quality Supervision, Inspection and Quarantine. But Chinese consumers have also eaten beef from the US, Brazil and India without knowing it, owing to the smuggling business. Pan Chenjun, a Hong Kong-based industry analyst at Rabobank, estimated that around 1 million tons of beef is smuggled into the mainland every year through Hong Kong and Vietnam, more than three times the amount of beef imported through legal channels in 2014. The large amount of cheap smuggled beef has also disturbed the domestic beef market and damaged the domestic cattle industry, Cao Binghai, a professor at China Agricultural University, told the Global Times in May.